Travel diary & photos of 4 months travelling through South America - Chile, Peru, Bolivia and Ecuador. Designed to W3C XHTML 1.0 Transitional Web Standards and features the new WebAlert Photo Slideshow. 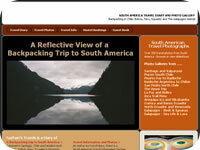 Blast from the past ... my backpacking trip to South America.